Mark Avera delivers the closings at trial against Domino's Pizza over the crash that paralyzed and ultimately killed Richard Wiederhold. Jurors found the pizza company liable and awarded more than $10 million. 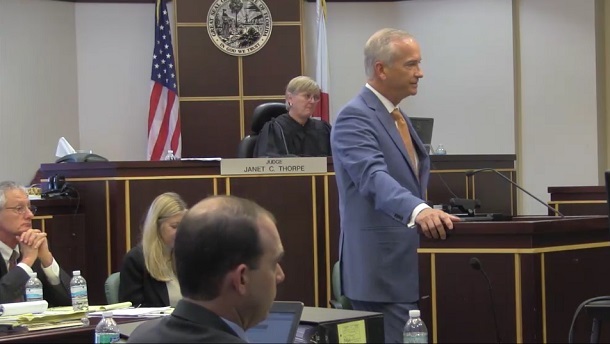 Orlando, FL—Jurors last week handed down a $10.1 million verdict against Domino’s Pizza for the wreck that paralyzed and ultimately killed a former Brevard County fire chief. Wiederhold v. Domino’s Pizza, 2011-CA-001589. The jury took less than three hours Friday to find pizza delivery driver Jeffrey Kidd and Domino's liable for a January 2011 wreck that overturned a pickup truck driven by Richard Wiederhold. The accident occurred on Florida’s State Road 50, when Kidd, a driver for a Domino’s franchise owned by Fischler Enterprises, allegedly pulled in front of Wiederhold, who swerved into a median and back across the roadway before the truck overturned. The accident left Wiederhold, a Central Florida firefighter for more than 30 years, a quadriplegic. A year later, Wiederhold, 62, died from complications stemming from his paralysis. Wiederhold’s wife, Yvonne, who was engaged to Wiederhold and traveling with him at the time of the accident, claims her husband swerved to avoid hitting Kidd, who she contends pulled dangerously into Wiederhold’s path. Friday’s award includes $10 million to Yvonne Wiederhold and more than $100,000 in injury-related expenses. Jurors apportioned 90% of fault for the wreck to Kidd and 10% to Wiederhold, likely reducing the award to a little more than $9 million post-verdict. The decision capped a four-day trial that focused largely on who caused the accident and whether Domino’s was liable for Kidd’s actions. During Friday’s closings, Rissman Barrett’s Richard Womble, representing Domino’s, argued evidence proved Wiederhold caused the accident by speeding and then swerving to avoid Kidd rather than braking. Regardless of which driver was at fault, Womble argued evidence proved Domino’s wasn’t liable for the accident because the Fischler franchise that Kidd worked for was an independent business rather than an agent of the pizza chain. Womble walked jurors through the franchise agreement, claiming its language did not give Domino’s enough control over the franchise to render it an agent. Key decisions, such as the hiring and firing of personnel, were left to the franchise, which was referred to as an independent contractor in the agreement, Womble noted. And while a company guide detailed various requirements the franchise must fulfill, Womble said, “It’s 17 sections [long and]…, maybe four chapters are required." The jury’s $10.1 million award matched Avera’s request during openings. CVN recorded the trial and will offer gavel-to-gavel footage on demand as soon as it is available.